Kruger National Park in South Africa is where nearly 2 million hectares of unrivalled diversity of life forms fuses with historical and archaeological sights this is real Africa. The world-renowned Kruger National Park offers a wildlife experience that ranks with the best in Africa. Sighting the "Big Five" has become something of a quest for many people when on safari, and the Kruger National Park has more than its fair share of these. 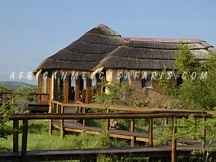 Below is a listing of Southern Kruger accommodations in South Africa. To view complete details on the accommodation, click on "Read More+" under each camp or lodge photo. Camp Shawu named after the most famous of the African elephants, the Magnificent Seven. 'Shawu bull' roamed the valley here for sixty years. 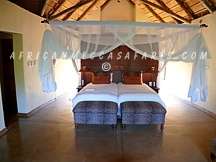 The camp can accommodate 10 guests in 5 very large rooms overlooking the Mpanamana dam. All are luxuriously equipped with romantic ball and claw bath, sitting area facing open fireplace, ceiling fans and outside shower. Camp Shonga is a small intimate bush retreat resting in the foothills of the Lebombo Mountains, overlooking the African bushveld. As part of 15000 hectare private concession in the Kruger National Park, Camp Shonga gives the guests the opportunity to experience the real Africa majestic, unfiltered and unadorned. The camp can accommodate 10 guests in 5 individual tents. 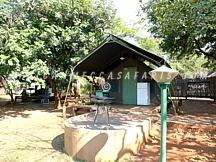 Crocodile Bridge Camp is a public camp site situated in the south-eastern corner of the Kruger National Park, on the northern bank of the Crocodile River, from which it derives its name. The camp has 18 caravan sites, 8 permanent canvas tents and 20 bungalows. Crocodile Bridge has a small cook-to-order restaurant and convenience shop. Lukimbi Safari Lodge is a stunning luxury safari lodge situated in the easily accessible southern portion of the Kruger National Park, South Africa. Raised walkways lead guests to 16 spacious suites, all combining luxury and modern African decor with stunning river views. All suites are air-conditioned, have fans, safes, mini bars, as well as tea and coffee facilities. Private decks leading out towards the river provide the ideal place to relax or enjoy bird spotting and game viewing in peace and tranquility. 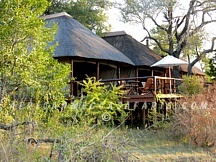 Shishangeni Lodge is situated on a 15000 hectare private concession of the world-renowned Kruger National Park. 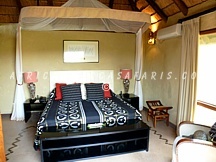 Shishangeni has 22 individual suites, accommodating 44 guests. All suites are luxuriously appointed with private game-viewing deck as well as mini bar, fireplace, outdoor shower and sitting area. The lodge also offers big five game viewing, superior service, excellent cuisine as well as the childcare facilities one would expect from a private game lodge.